Fusion stemware withstands the wear and tear of everyday use and never dulls or clouds. Fusion stems are scientifically shaped to enhance the best qualities of your wine. Save 20% on the Complete Fusion Classic Wine Glass Collection. Size: 8-1/2"H x 2-7/16" Dia., 15 oz. How thin is the bowl glass compared to the riedel wine line and the riedel vinum line? BEST ANSWER: The fusion line is phenomenal, a great combination of light and strong. The Riedel thinness is ever so slightly more but based on your question please see the Fusion Air Line which is the "thinnest" of the fusion lines and more similar to the Riedel glass. As per the copy which summarizes this best , "Fusion Air melds handblown, lead-free crystal with magnesium to produce a glass that is strong, lightweight and remarkably break-resistant". I own and use both Fusion and Riedel , hope this is helpful. I Love the fusion classic. It is thicker than the fusion air or the very fragile Riedel line. The fusion classic has always been our “go to” daily wine glass! They will still break it it tips over or hits a hard surface, but is much less fragile than the Riedel. The fusion air is probably less fragile than Riedel, but appears to be very fragile. The class seems a bit thinner, but the Fusion is much stronger. It is a lovely looking glass that is break resistant. And it is the first wine glass I have ever put in a dishwasher and it comes out sparkling and crystal clear. I have both types and Riedel might be a tad thinner if any. I love both and think they are as elegant, but l break Fussion less. It is thicker but no a lot. What is the height on the glasses? BEST ANSWER: The chardonnay glass is 8.5" tall. They are billed as "unbreakable" but that's not the case. Also, I tried to contact Wine Enthusiast about that issue and they never responded. However, they truly resemble a much more expensive wine glass. The Fusion Classic Chardonnay Wine Glasses are 8 1/2 inches high, 2 7/16 inches in diameter and they hold 15 ounces. About 7.5 inches. We love them -- fine wine glasses with less breakage. White 9" Red 10 "
BEST ANSWER: They use to monogram them but when I purchased additional glasses last year I was told that they no longer monogrammed these (Fusion Classic} glasses I had to get mine done myself. Fortunately I found someone who matched the font. Here at Wine Enthusiast, we customize many of our products. This is a custom order which cannot be placed online. Please call our sales department at 800.356.8466 and they can assist you with this. Thank you. Fusion glassware is made & sold by the Fusion Company. The Fusion Company is a US based maker home and decor products. Is it fairly common to use these glasses in a high volume Restaurant setting? -If so does fusion honor the replacement guarantee on defected/chipped glasses? BEST ANSWER: The Fusion Classic Chardonnay Wine Glasses (Set of 4) are durable enough to withstand restaurant use and the guarantee will cover defective/chipped glasses. I have 12 of these glasses with a 10 year warranty and love them. However, one of the glasses has cracked. How do I get the warranty replacement? I no longer have the boxes the glasses came in. In responding to the question about the thickness of the Fusion bowl vs. the Riedel bowl, you didn't answer with either dimensions or even, at a minimum, relative info (Does "almost identical" mean Fusion is thicker or thinner?). 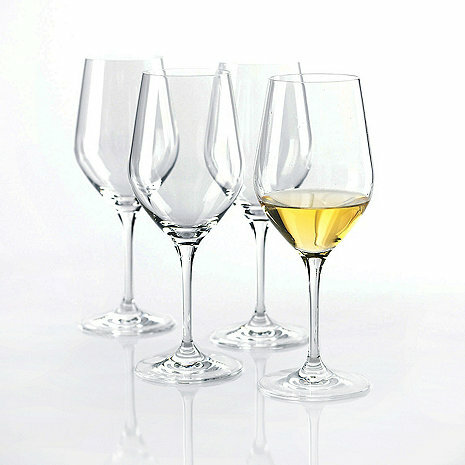 In addition, please let us know what are the thicknesses of the Fusion and Riedel stems. Would greatly appreciate the feedback. BEST ANSWER: Fusion is thicker than riedel as far as the bowl goes. Regarding the Fusion classic line, we drink a lot of pinot gris, so should we go with the chardonnay set or the riesling/sauvignon set? Why? BEST ANSWER: The sauvignon blanc set. They have similar grape characteristics. BEST ANSWER: The base measures a drop over 3 1/8" the mouth is smaller. My mother tends to accidentally break glasses while washing the dishes. Should this glass fall into the sink, would it break? BEST ANSWER: Thank you very much for your question. As the Fusion is still glass, any fall could potentially break the glass. Fusion glasses are design to withstand small impacts and they have been great for many customers throughout the years! We do have a 10 year replacement plan where if a glass breaks, we replace the glass no charge, just pay shipping and processing. Hope this helps! Thank you again. My wife and I entertain frequently and have been using Fusion stemware for 3+ years with very minimal breakage, (2 of 32 glasses). Being dishwasher safe was a huge selling point but the design and overall durability, even in our outdoor kitchen setting, has made us fans for life. Great style and great product. Swished off a Fusion chardonnay glass into the dishwasher. It bounced off the edge of a dinner plate and lay on the rack uncracked! What a pleasant surprise. Truly impressive and beyond expectations. Elegant,too. Extremely prompt delivery. Great customer service. This is an attractive product that is wonderful for everyday use. Using other products for the length of time we have used these, we would have probably broken 1 or 2 glasses by now...that is our trend. However, we have yet to break any of these glasses. Although I have not turned the glass over, I have tapped it on my counter and it seems to be very tough! These are supposed to be break-resistant, and they claim to replace it if it breaks within 10 years, but the warranty specifically excludes breakage cause by pressure or impact. What good is that?? Although the break-resistant feature has not yet come into play, I just love the look and feel of these glasses. Will be purchasing more soon! Fusion stemware is terrific! It's light and durable and feels comfortable in the hand. The wine looks beautiful in it too. The color just pops. Best of all, if anything does happen Wine Enthusiast stands behind you. And I know, I had a glass break once and W.E. had a new one in the mail to us in a heart beat. I've kept buying pieces because of this. The glasses looked great but were returned. The catalog stated they were 7 5/8" high and that height was also written on the box. However, the actual glass was 8 1/2". We had ordered these because of the height and it was misrepresented. we are most satisfied with these glasses; elegant yet practical for everyday or special occassion use. Love the shape, and the size is perfect for different types of wines/beverages - not too big and not too small. Have lost expensive glassware in past, mainly while giving routine care (towel drying). My existing set has held up very well, so I wanted to add to it. These glasses are both fine and durable, and a good size for either dining or party use. Still won't put in the dishwasher, but feel confident I can wash them without breaking. This glass feels just like our expensive wine glasses. I'm hoping they last longer! So far, so good. Truly a remarkable wine glass! This tall chard has a long stem, perfect for holding. The bowl shape certainly enhances the wine. Very thin glass lip but very sturdy as well, amazing! Bought 3 boxes of thechablis/chardonnay style as a christmas gift - the recipient LOVED them! I got to use them too and they are wonderful to drink out of. I personally think the shape lends itself very well to any white or red wine if you are wanting a shape that can serve both purposes without having to have shelves full of different style glasses. They are pretty to look at and seem sturdy. I just bought them for Christmas. As advertised. So far, so good. Only used them a few times, but they’re beautiful, feel great, and drink nice. I have owned these for 24 hours and I have already recommended them to two friends! The first time I used one I hit it on my granite countertop, no damage! Reidel would have been history! Better than advertised! An excellent value. Perfect size and shape and unbreakable! I purchased these to replace our set of Reidel Chardonnay glasses. I love the feel and elegence of Reidel, but they've broken a little too easily as of late. So far these have been held up well to daily usage and are 'in-law' tested. Great form and function for an everyday glass. I've not tempted fate and put them in the dishwasher, although it says you can. WE offers lifetime replacement .. have not needed it yet, but its good to have. These are the perfect glasses for having friends over for a casual dinner, or hosting a party! They survive the dishwasher and come out spotless! Thiese glasses are lovely to look at and use. They really are stronger and more break resistant than any other brand I have owned. They are the first wine glasses I have ever put in a dishwasher and they come out sparkly clear and shiny. I am sold and highly recommend them! and considering they are relatively unbreakable, they are a really good deal. Nice size and feel. The perfect wine glass! Perfect look and feel, and holds up to dishwashing and frequent use! Great, really, for white or red wine! Light and durable and posing nice style.we are really enjoying them. These are wonderful glasses. I've bought several sets of them. Th3ese are fine, functional all-purpose stems. I use them for everything from bubbly's to whites and reds. We use these glasses everyday and put them in the dishwasher. The glasses were beautiful, but one had a wide scratch and another one had a scratch and glass spur on the rim, which broke the second time washing it. I've always loved my Fusion glasses, and have had no problems with the Cabernet or Pinot Noir glasses. Will try to get a replacement for the broken one. This glass fits into any occasion, informal or formal. A great option for everyday white wine drinking. Goblet base keeps wine cool and shape concentrates mild aromas of most whites. We use these glasses all the time! They clean very well in the dishwasher and don't streak as much as others!!!! I buy them for friends as gifts as well. nonbreakable always gets my attention--I love Reidels but break them often--this is a nice alternative to very expensive wine glasses; I will use informally and formally. Not afraid to use on patio dining. BACKYARD GATHERING, INFORMAL, EVERYDAY. FEEL OF EXPENSIVE GLASSWARE. REAL TEST COMES WHEN GLASS HITS THE TILE FLOORING. We were looking for some simple but elegant wine glassesthat could be used regardless of the occasion. These fit the bill. Our family loves Fusiin glassware and has been buying and giving it as gifts for many years. The only breakage sometimes occurs in the dishwasher if packed too close together. We have had no trouble getting them replaced quickly. We use the Fusion Chardonnay glasses in each of our eight bedrooms in our bed and breakfast. With the exception of tipping over on marble counters and breaking, we have been pleased with their appearance and durability! I love this glassware. However, the guarantee against breakage is deceptive - they'll replace the glass, but will charge you about 10.00 shipping and handling - about the cost of the glass in the first place. That being said, these are very nice and elegant - practical for everyday use, but nice for company also. I have reidel stemware for entertaining, but would use these also - very classy.